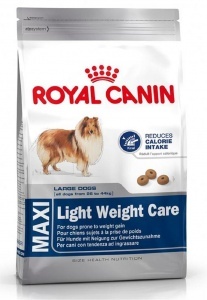 Complete dry food for adult large dogs with weight problems. 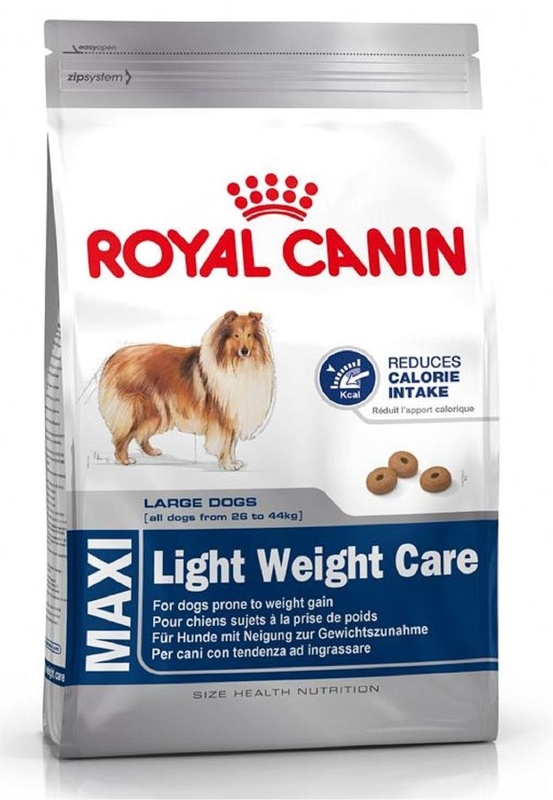 Royal Canin Maxi Light Weight Care helps to prevent excessive weight gain and the health risks (such as diabetes and joint problems) associated with it. The reduced calorie content and increased protein level helps promotes a healthy muscle mass. Less active dogs often suffer from digestive problems. Maxi Light is high in fibre to minimise this risk. The combination of varied carbohydrate (rice, maize and barley) provides slow-release energy. dehydrated poultry protein; maize; barley; vegetable fibres; vegetable protein isolate*; wheat; maize gluten; maize flour; animal fats; hydrolysed animal proteins; cellulose powder; beet pulp; fish oil; yeasts; minerals; fructo-oligo-saccharides; soya oil; hydrolysed crustaceans (source of glucosamine); hydrolysed cartilage (source of chondroitin). Protein: 27%; Fat content: 11%; Crude ash: 5.3%; Crude fibres: 9%.